No stone is left unturned on this epic journey across the heart and Top End of Australia’s frontier. Shaped by eons of exposure to the wild elements, the rugged beauty of this region is stunning and your time in this incredible land will be simply unforgettable. Uluru is always a special place to visit, but with the spectacular ‘Field of Light’ artwork it will be something else. Delight in taking one of the world’s great train trips, The Ghan, before exploring sultry Darwin and the fascinating landscape of Katherine Gorge. The beauty of Yellow Water Billabong and the grace of the Ord River will take your breath away. Sink deep into the stories and culture of traditional owners and marvel at the extraordinary ingenuity of farmers and miners. Your journey will conclude in one of the loveliest parts of Western Australia, the vast sandy beaches of Broome. Welcome to the very heart of Australia. Begin your discovery of the Red Centre this afternoon with a visit to the Uluru and Kata Tjuta Cultural Centre. Enjoy your Special Stay for the next two nights and your welcome dinner. Optional luxury wilderness camp stay - Opportunity to upgrade your stay to the luxurious Longitude 131° luxury wilderness camp. This will substitute accommodation and tour activities. (Additional expense, must be booked before departure). Be filled with wonder as the sun rises over Uluru, followed by breakfast and an informative walking tour of significant sights around its base, or choose a Harley-Davidson™ motorcycle ride to the viewing point overlooking Uluru. Alternatively, see the desert from the top of a camel or enjoy a trek around the base of Uluru. Discover the mysteries of Kata Tjuta and Walpa Gorge during your afternoon visit. Tonight, enjoy a unique dining experience set amidst the ‘Field of Light’. With Uluru as a back drop, as the sun sets and the lights start to twinkle, just like the stars above, you’ll enjoy canapés and authentic Australian cuisine. Optional flight - View Uluru and Kata Tjuta from the air. (Additional expense). Travel to the rugged Kings Canyon. Walk along the rim to discover a beautiful area of cool waterholes or stroll along the canyon floor for a more relaxed walk. Optional flight - An opportunity to gaze in wonder at this amazing canyon from the air on a scenic flight. (Additional expense). Your overnight stay is at Kings Canyon. Observe the majesty of the East MacDonnell Ranges as you approach Alice Springs, Australia’s most famous outback town. Enjoy a city tour, including a visit to the legendary Royal Flying Doctor Service, then check into your hotel for a two night stay. Dinner tonight is served outdoors and is an outback bush BBQ with bush damper cooking and entertainment by a bush balladeer. Journey by 4WD to the oasis of Palm Valley or experience the grandeur of the West MacDonnell Ranges and Standley Chasm. Alternatively, enjoy a Taste of the Outback. Tonight, enjoy dinner at the hotel with the Sounds of Starlight Didgeridoo Theatre. Visit Anzac Hill for panoramic views of Alice Springs before an Aboriginal Cultural Tour to the Alice Springs Desert Park and a visit to the School of Air. All aboard for your overnight Special Stay on the famous Ghan train (Gold Service). This is one of the world’s greatest train journeys. Relax in the Outback Explorer Lounge before dinner in the Queen Adelaide Restaurant. Enjoy breakfast on board as you gaze out of the window taking inspiration from the ever-changing landscape.Upon arrival in Katherine, choose between a guided cruise through Katherine Gorge, where you will marvel at the towering red ochre sandstone walls and hear stories of the Jawoyn people or enjoy The Ghan’s cultural experience that will take you to the heart of this area. Create your own indigenous painting, learn to throw a spear and hear ancient Dreamtime tales. 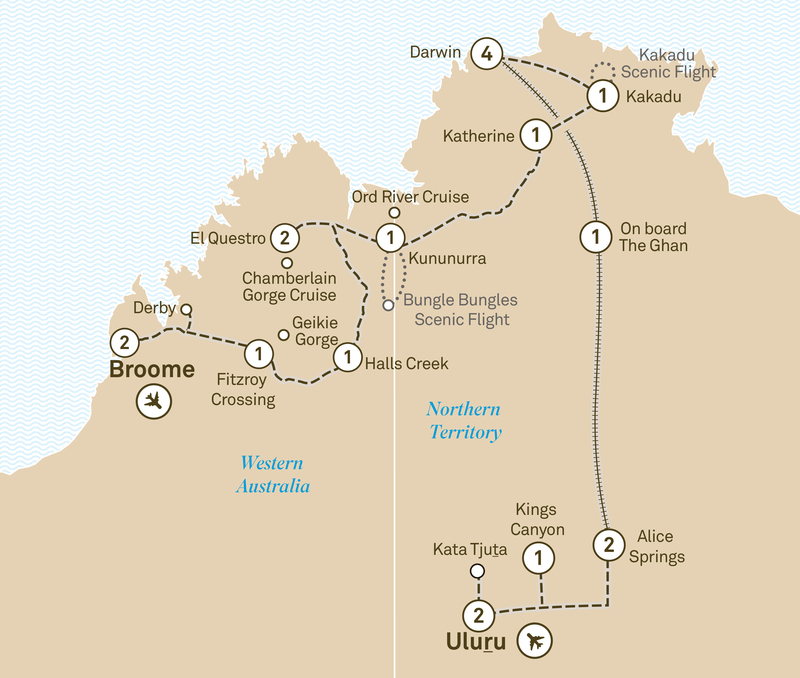 Reboard the train and travel to Darwin for your four night stay. Cruise on the Adelaide River, home to the ‘jumping crocodiles’ or visit Litchfield National Park. Take the hop-on-hop-off bus around town or a tour of the WWII Bombing of Darwin. Enjoy dinner tonight at the hotel. Relax and take pleasure in your surroundings before dinner.